For my PHYS205 class, students were asked to come up with presentations about a scholarly article or some other relevant topic. I’ve included the presentations below. I was very happy with how they turned out. Amanda Bohney’s presentation about the discovery of pulsars. Kevin Ketterling’s presentation on flares from the supermassive blackhole in the center of our galaxy. Thomas Florence’s presentation about the disruption and accretion of an asteroid by a white dwarf. Boise State has partnered with local libraries, astronomy clubs, and science museums to organize outreach events all over the state throughout 2017. With these partners, Boise State will host public presentations about the eclipse and provide eclipse shades for safe viewing. 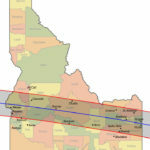 You can find more information about the eclipse in Idaho at the Physics Dept’s website. The calendar below shows the planned visits across Idaho. If you have questions, contact Prof. Brian Jackson (bjackson@boisestate.edu). This outreach effort is supported by a grant from the Idaho STEM Action Center and by donations from the Boise State community. Posted in: BSU Journal Club. Tagged: close-in planets, exoplanets, hot jupiters, Kepler mission, ultra-short-period planets. 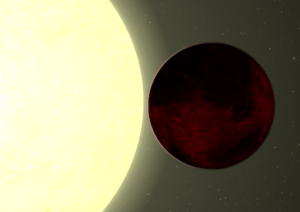 Artist’s conception of the ultra-short-period planet Kepler-78 b, discovered by Sanchis-Ojeda and colleagues in 2013. An eyebrow-raising paper emerged recently from Prof. Josh Winn and colleagues about a type of planet near and dear to my heart, ultra-short-period planets, or USPs for short. These planets are roughly the size of Earth and probably rocky but are hundreds of times closer to their host star than the Earth is to the Sun. These planets are so hot some have melted daysides and others are evaporating. Because they’re so much closer to their stars, ultra-short-period planets zip around their stars in just hours – hence the clunky name. Our group, along with others, has suggested USPs might be the remnants of hot Jupiters (gas-giant planets close to their stars) that had their atmospheres ripped off. If so, we’d expect systems hosting USPs to resemble systems hosting hot Jupiters. One distinctive feature of stars with hot Jupiters is that they have more iron (Fe) and other heavy elements in their atmospheres. Astronomers call the amount of heavy elements (“metals”) stellar metallicity. 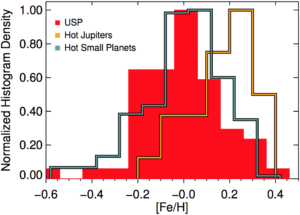 Hot-Jupiter host stars are heavy in metals probably because planets form from the same materials as the star and big planets need large amounts of metals to form. The same trend doesn’t seem to hold for small, roughly Earth-sized planets, though – small planets don’t seem to be as picky. So, if USPs are hot Jupiters that lost their atmospheres, their stars should also be metal-rich. Figure 4 from Winn et al. (2017), showing the distribution of stellar metallicities for USP-hosting stars (red), hot Jupiter-hosting stars (orange), and stars hosting small but slightly longer period planets (blue). But the recent paper from Winn and colleagues throws this origin story for USPs into doubt. In their study, they looked at metallicities for stars hosting USPs, stars hosting hot Jupiters, and those hosting small planets a bit farther out than USPs, all discovered by the Kepler Mission. The figure at left shows their results. As expected, the orange curve for hot Jupiter hosts peaks toward higher metallicity (that is, toward bigger [Fe/H]-values), and if USPs are former hot Jupiters, the red histogram should look like the orange one. Instead, it looks a lot like the blue one for smaller, farther out planets. This result suggests that USPs are just like their longer-period cousins – planets that have always been small, just with very short periods. What to make of this? There’s some statistical wiggle room, allowing some, but not all, USPs to have been hot Jupiters, but Winn’s analysis says no more than 46%. It’s also possible that the boundaries between what Winn calls “hot Jupiters” and what he calls “hot small planets” could be refined by additional analysis, shifting the orange curve down a bit (or maybe shifting the blue curve up). But the chances that USPs experienced a dramatic and brutal origin are a little slimmer now. Maybe that’s a good thing – it says the universe might be a little bit less violent than we thought. Posted in: Public Outreach. Tagged: ponyup campaign, solar eclipse. To those of you who have given to our Pony Up Campaign, thanks very much. We have raised more than $3,000. 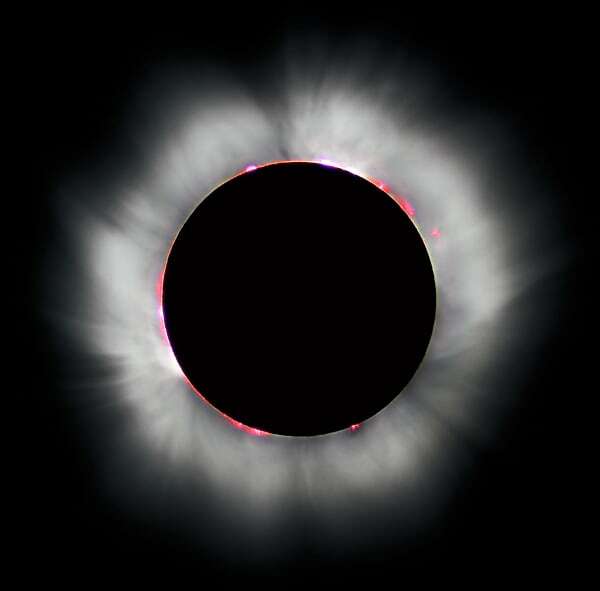 We are very gratified for your very generous donations to our Eclipse Outreach project. Thanks to you, we will have a very robust and engaging public outreach effort this summer, reaching folks from all across our state. We’ve already scheduled several of the trips, with more to come. Keep checking this space for additional details on those events. I’m also excited to announce that we just placed our order for eclipse shades, giving us nearly 13,000 pairs in total! That’s almost 13,000 pairs of eyeballs that will be able to safely enjoy this once-in-a-lifetime event in August. And if you haven’t donated yet, don’t worry – there’s still time to help out and get your own shades. Once the shades come in, we’ll mail them out to qualified donors as quickly as we can. So keep an eye on your mailbox in the coming months. And special thanks to donors Tracy Landauer, Justin McGilvery, and Robert Jahn. Posted in: Meetings, Uncategorized. Tagged: exoplanets, futurama. I just arrived home after a week-long visit to Aspen, CO to attend the Formation and Dynamical Evolution of Exoplanets Conference at the Aspen Center for Physics. This conference was a cozy affair, with just over 100 attendees, and was narrowly focused on dynamical questions and approaches related to the origins and fates of exoplanet systems. Researchers from around the world gave presentations on topics ranging from the dynamics of debris disks to observations of planet-hosting binary star systems. Blocks of presentations were punctuated by lengthy coffee breaks, when the real scientific give-and-take takes place. These interludes often give rise to groundbreaking, thesis-motivating, all-nighter-pulling research ideas. Most of the presentations and conversations were excellent and inspiring, and I can’t do them all justice in a short blog post. So I’ll just talk about one that struck me in particular. On Tuesday, Hanno Rein at Toronto spoke about a new N-body integrator his team has been developing in recent years, called REBOUND. This new framework may spur a revolution in dynamical modeling of astrophysical systems. In astronomy, “n-body integration” is jargon for the numerical simulation of interactions among multiple (“n” of them) gravitating bodies. For hundreds of years, astronomers have been able to describe the orbital of two gravitating bodies quite easily, thanks to Johannes Kepler. But as soon as you add another body to the system, there is no exact way to solve for the orbital motion of the bodies (except in very specific and limited circumstances). Even in the case of two bodies, if you want to include more complicated forces than simple gravity, solving for the orbital motion can be quite difficult. To surmount these difficulties, scientists have turned to computer simulations to model in an approximate way the evolution of n-body systems. Although scientists have spent decades coming up with better and better models and algorithms, n-body simulations can still take a lot of computing power, and the often complicated codes can be cumbersome to set up and run. More than that, it’s often difficult or impossible for scientists to share results because there’s no good agreed-upon format for simulation output. Rein’s REBOUND open-source code solves several of these problems at once: it employs latest modeling schemes to track orbital motions and gravitational interactions; it can be run using inside of an iPython Notebook; and it provides a uniform format for simulation output which anyone can use to re-run or re-analyze another scientists work – critical for scientific reproducibility. The iPython Notebook also provides a really neat visualization capability so you can directly watch the evolution of your astronomical system. Time evolution of the orbits of stars in Leela’s constellation. The code is so easy to run, in fact, that I installed and began running it immediately after Rein’s presentation. And all of its capabilities allowed me to finally simulate and visualize the evolution of a system I’ve wanted to look at for a long time – see animation at left (see here for how I created it). I also gave a presentation on our group’s work looking at disruption of gaseous exoplanets. And so, the combination of beautiful scenery and beautiful science made the Aspen Exoplanets conference one of the best in recent memory.